Note: This article was originally published in the September 2007 issue of the Denver publication Community News. Peaches originated in China and were introduced to California by Spanish missionaries in the 1700s. Today they are grown in 36 U.S. states. Although Georgia is called the Peach State, California produces 99% of all cling peaches. Cooling in nature, peaches are high in fiber and in Vitamins A, C, and E. Unlike most fruits, they contain calcium. They can help ease dry coughs and relieve constipation. One medium peach provides only about 50 calories, less than the 60 calories in a medium apple. Fresh peaches are seasonal, but peaches can be enjoyed canned or frozen all year round. A red blush on the peach indicates the variety, not ripeness. Ripeness is indicated by a peachy aroma and some softness, so choose a peach that gives slightly to palm pressure. 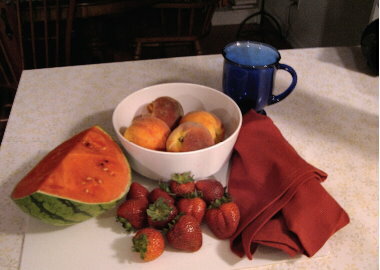 Hard, out-of-season peaches and those with greenish skins will not ripen or become sweet, so buy them ripe and enjoy them soon. While doing the research for this article, I ran across an ad for Zoe Juice, produced right here in Colorado from Colorado peaches and apples. It takes three peaches and two apples to make each 12-oz. bottle, which also contains 10 grams of whey protein isolate and 1 tsp. of honey for added energy. The juice is fat and lactose free, and is bottled weekly for freshness. One 12-oz. bottle can be used as a meal replacement. For ordering information, see www.zoejuice.com. A case of 25 bottles costs $50. The strawberry is the most popular berry fruit in the world. Strawberries have grown wild for thousands of years, and were highly prized by the ancient Romans. In the early 1700s, a French engineer brought back to Europe a variety of strawberry native to Chile and Peru. In France, this variety was crossed with a North American variety, and the hybrid strawberry with which we are familiar was born. The current largest commercial producers of strawberries are the U.S., Canada, France, Italy, Japan, Australia, and New Zealand. Strawberries are at their peak from April through July. Their unique phenol content makes them heart protective, anti-cancer, and anti-inflammatory. They are a good source of Vitamin C, manganese, fiber, folate, magnesium, copper, and Vitamins B5 and B6. It's said that medium-sized berries are often more flavorful than very large ones, but the large Driscoll's berries we have been buying lately taste wonderful to us. A pretty and nutritious dessert can be made by layering blueberries and cut strawberries with plain or vanilla yogurt - or vanilla ice cream, of course. If you have never tried soy ice cream or ice cream made from rice milk, pick some up at your nearest health food store and get ready for a real taste treat! When buying pre-packaged strawberries, make sure they are not packed too tightly. Avoid a container with stains or moisture, which can indicate spoilage. Remove any molded or damaged berries before storing them, unwashed, in the refrigerator. Wash them gently, stems on, just before eating. Buying organic strawberries will help you avoid pesticide residues. Berries can be washed, dried, and then frozen in a plastic container for future use. Freezing them whole preserves more of their Vitamin C.
Watermelons, which are related to cantaloupes, squash, and pumpkins, originated in Africa. The ancient Egyptians loved watermelons, and even placed them on the tombs of kings. They were brought to China as early as the 10th century, then to the New World in the 1500s. They are high in Vitamins C, A, B1, and B6. A cup of watermelon contains only about 48 calories. That's because the fruit is 92% water, making it ideal as a thirst quencher. To select a flavorful cut watermelon, look for deep-colored flesh minus any white streaks. Seeds should be dark in color. If buying a whole watermelon, buy one that is heavy for its size and that has a smooth rind, not too shiny or dull. Important: One side of the melon should have an area that is different in color from the rest of the rind, an area that is yellowish or creamy in color. This underbelly shows where the melon rested on the ground until ripe. If this lighter area is missing, the melon may have been harvested prematurely, making it inferior in taste, texture, and juiciness. Choose a watermelon that is symmetrical in shape, that has a very slight softness to the touch, and that is free of cracks, bruises, and soft spots. Don't bother sniffing the watermelon; if it's been chilled, it won't have much smell. A watermelon will not get sweeter after it's been harvested, but letting it sit at room temperature for two or three days will make it juicier. After cutting it, store any unused pieces in the refrigerator in a plastic container or covered in plastic wrap. Mixed fruit salad, if properly refrigerated, retains most of its nutrition for as long as a week. So mix and enjoy to your heart's content!